A&E APRIL 2019 • a-e-mag.com 23 shops, and bakeries that do weddings (cakes are not the only official dessert anymore). Call ahead to see when you can stop by for a few minutes. Let them know you aren't looking to sell to them but to be another resource for them to assist their brides and grooms. Be sure to bring wedding-themed samples and discuss why/how you can team up with them to help service the wedding couple. They may allow you to leave some fliers or samples at their facility or ask you to leave a few business cards. Don't forget, they all need personalized products as well. Research wedding/bridal markets or fairs — these are typically at the beginning (after all the holiday engagements) and middle of the year. Purchase a small booth space and set up a table of your products. Be sure to have fliers or business cards to hand out and lots of samples. Vistaprint or your local printer can print some off for you to hand out. 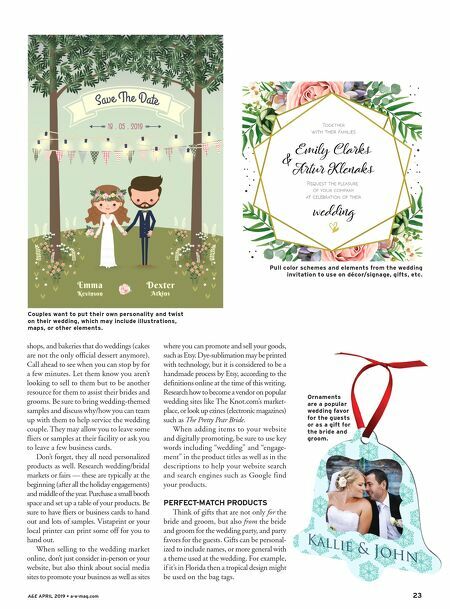 When selling to the wedding market online, don't just consider in-person or your website, but also think about social media sites to promote your business as well as sites where you can promote and sell your goods, such as Etsy. Dye-sublimation may be printed with technology, but it is considered to be a handmade process by Etsy, according to the definitions online at the time of this writing. 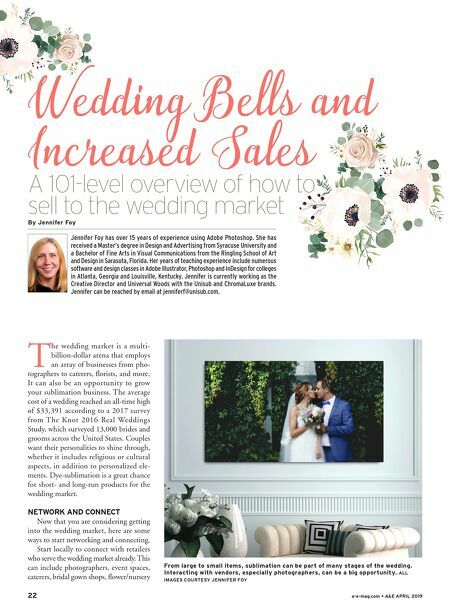 Research how to become a vendor on popular wedding sites like The Knot.com's market- place, or look up ezines (electronic magazines) such as The Pretty Pear Bride. When adding items to your website and digitally promoting, be sure to use key words including "wedding" and "engage- ment" in the product titles as well as in the descriptions to help your website search and search engines such as Google find your products. PERFECT-MATCH PRODUCTS Think of gifts that are not only for the bride and groom, but also from the bride and groom for the wedding party, and party favors for the guests. Gifts can be personal- ized to include names, or more general with a theme used at the wedding. For example, if it's in Florida then a tropical design might be used on the bag tags. Pull color schemes and elements from the wedding invitation to use on décor/signage, gifts, etc. Couples want to put their own personality and twist on their wedding, which may include illustrations, maps, or other elements. Ornaments are a popular wedding favor for the guests or as a gift for the bride and groom.